* I prefer RTS input style for telugu because it is easy. To run SCIM (i.e., Telugu Input) whenever you login into GNOME, do this – Open gnome-session-properties ( System > Preferences > Sessions ), Click Add button in Startup Programs tab, fill the Name and Command as scim, Restart the Gnome session or just run scim command from terminal. After restart, now you can type telugu everywhere (at GTK, Qt ). Just right click where you want to type telugu select input method as SCIM, and press ctrl+space to switch from telugu to english or english to telugu. You have to select the telugu language from the scim toolbox. Got very excited with the Telugu language (మాతృ భాష) in Linux ? Check Telugu Support, Click Apply. This entry was posted in telugu, ubuntu and tagged gutsy, hardy, linux, render, rendering, scim, telugu, ubuntu. Bookmark the permalink. శుభం. The procedure for Edgy is even simpler (one does not need to install my packages because Edgy already comes with the required versions). 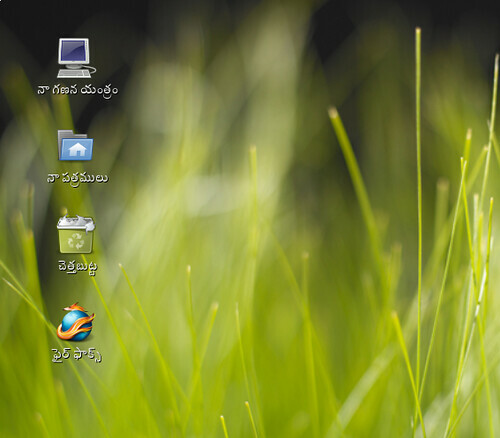 I have followed the steps to install telugu fonts in my laptop. i am having ubuntu edgy and firefox and after i followed the steps and restarted the laptop and when i open telugu website (eenadu) my browser is getting closed automatically. is there something i am missing in my installation or do i need to do something for this problem? but when i open http://www.swecha.org/?q=node/23, its showing perfectly. Open firefox from the terminal and check for any error messages. Is that problem is only when you open eenadu page or all telugu pages ? The problem is only when i try to open eenadu website.I am not a linux guy but i am starting to be. download eenadu font from here : http://www.eenadu.net/eenadu.xyz . Rename it as eenadu.ttf then move it to /usr/share/fonts/truetype/ttf-telugu-fonts/ then enter ‘sudo fc-cache’ command , Try to open eenadu website after restarting the firefox. Then you ‘ll get correct telugu rendering in http://eenadu.net. I downloaded eenadu fonts from the eenadu website and copied into the ttf-telugu-fonts folder and it works. i could read the eenadu news online now, but i have a small problem here. The fonts are displayed with small hyphen symbols. its like this -thaa-jaa -vaarhta-lu. In version 6.04 i was able to see the Telugu font Web pages properly after following your instructions. I recently upgraded my Ubuntu Os from 6.10 to 7.04. After upgrading to 7.04, again, i was not able to see the Telugu font properly. Is there any issues with 7.04 to see Telugu font web pages ? There is no issue with 7.04 rendering Telugu. 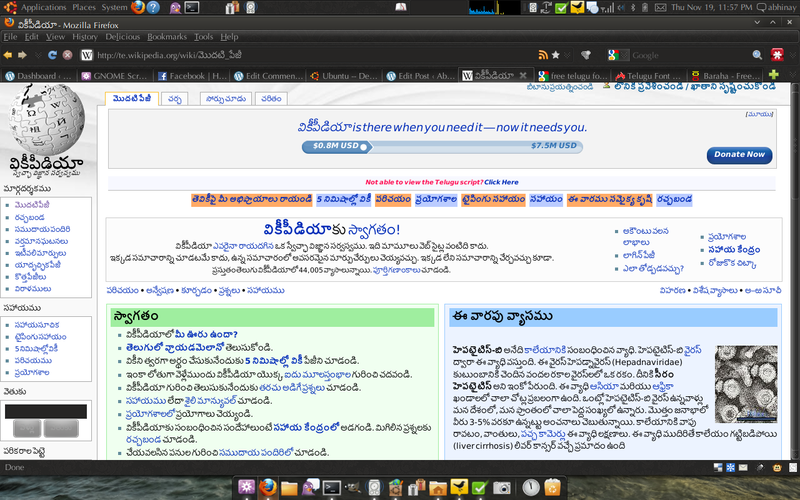 You can read Telugu web pages as in previous versions of Ubuntu. And make sure you have language-pack-te, language-support-te packages installed, if not apt-get them. And Let me know if it works. I do not have fonts.cache file in ttf-telugu-fonts directory. Did i missed something in upgrade ? Do you know how to get it ? You can download fonts.cache-1 file from here, Just fallow these steps. nice tutorial; thanks.. i would like to put it on my blog too..
btw… i am a linux newbie..
could you tell me what exactly is happening in the tutorial? after i install the ubuntu font package.. what’s the need to install a new font?? Actually, there is a bug with the pottana font , thats why i have used lohit font in Ubuntu Feisty. then shudn’t pothana be replaced with lohit [or some other font.] in ubuntu package?? Thanks a lot for the tip. Very useful. Tried and was sucessful with the instructions. However, ఈనాడు (eenadu) rendering has the extra “-“, which makes it difficult to read. ఆంధ్రప్రభ (aandhraprabha) was much worse with English alphabets overlaying the telugu text. Then I remembered that Mozilla / Firefox has the “padma” add-on for conversion of proprietary fonts (indian langauges) to public formats (and viceversa). Installing this (from https://addons.mozilla.org/en-US/firefox/addon/873 ) fixed all the issues. I didn’t install Ubuntu 7.10 on my box. I ‘ll let you know how to render or type telugu in Ubuntu Gutsy as soon as i install it. Thanks man! Am able to read telugu in firefox now. ఆభినయ్! ముందుగా మీకు నా కృతజ్ఞతలు. మీ పుణ్యమా అని ఉబంటూ8.04 లో తెలుగు టైప్ చేయగల్గుతున్నాను.కాకపోతే చిన్న ప్రాబ్లెమ్! లినక్స్ అనే పదంలో క్స తర్వాత పొల్లు కనిపిస్తుంది- నేను టైప్ చేసినా, ఏదైనా తెలుగు సైట్ చూసినా సరే! దీన్ని సరిచేసె ఉపాయం తెలిఅయచేయగలరు. మీకు క్రుతజ్ఞుడను. “ఞ ” మరియు ఇతర అక్ష రములు వ్రాయుటకు లెఖిని.ఒఅర్జి చూచాను. But, I didn’t understand the second sentence in your above comment. ఉబుంటులోకి మారి కొద్ది రోజులైంది.. తెలుగు రావట్లేదే అని తన్నుకుంటుండగా ఫైర్ఫాక్సు వారి సహకారం దొరికి, బ్రౌజర్లో మటుకు తెలుగు వచ్చింది. ఆపైన మీ బ్లాగు సాయంతో చక్కని తెలుగు దొరికినట్లైంది. మరో వెయ్యి ధన్యవాదాలు అందుకోండి.!! Is it possible to remap keys in SCIM; if so, how? If not, in any other intelligent IM? గణన యంత్రం, చెత్తబుట్ట భలే నచ్చాయి. I am very much happy with your work! Ubuntu is not as much metured as windows it seems. I had suffered & suffering regarding this initramfs problem, if u have any solution please give me, for which I may be very much thankful to you. this is happening only when I apply updates, sometime I had lost my family (valueble) fotos because of this. recently I encountered two more problems, sh>grub> prompt and booting issues. I think u appeared to be matured linux user. please give me information. I am new to linux. @Ramasami why do you want to remap SCIM anyway? There are many other alternatives if you want to remap keys. @Priyatam It’s old dapper package, isn’t ? @kamakshaiah Thx bro! Ubuntu is already very user friendly & stylish comparing to it’s predecessor versions. I haven’t got any problem with my initramfs. I just checked few ubuntu forums post. Found this workaround which worked for most of the users – Go to BIOS and change the SATA mode from ‘IDE’ to ‘RAID’. Not sure if it works, you can post your detailed problem to Ubuntuforums anytime they can help you. You can always use Live CD to recover your data in worst case. Boot into Live CD and Copy your important files from Ubuntu partition to your Windows partitions. I am very sorry for taking long time to ask you this question, you said I can recover data from Ubuntu partition and copy them to Windows. My problem is when boot from Live CD it doesn’t shows me being in my user prompt, and it shows me as it is a fresh installation, in which case, how can recover data. Please let me know in detail, for which I will be very much thankful. I submitted a new revision of te-rts.mim that assigns new Unicode characters for @2, ~c, ~j, ~l, and ~L; allows _ to be typed normally; adds j&n to produce jn literally; and cleans up the source code. Updated the blog accordingly! Thanks Suraj! Dear friend thanks for the guidence.మన ప్రాధమిక ఆరోగ్య కేంద్రాలలొ పనిచేసేసిబ్బందికి ఆషా కార్యకర్తలకు తెలుగు లో వెబ్ ఆధారిత సమాచారం తయారు చేసి ఇవ్వడానికి చక్కని మార్గం చూపించారు.అదీ లైనక్సు లొ . కృతజ్ఞతలు. Excellent post, its amazing that its necessary really but it is. I think Iarfhlaith�s point about bigger buttons attracting more comments is very true.